Art Basel & Miami Art Week are the epicenter of creativity in The United States, and as visitors from all over the world flock to Miami to spectate, artist Stefano Ogliari Badessi creates public installations that provide an interactive sensory experience. Badessi, determined to show the world that art has the power to change the landscape, has partnered with Swire Hotels to provide EAST, Miami with an impressive Balloon Installation on the 40th floor at Sugar, the hotel’s rooftop bar & garden. The installation will be accessible to ICA and Bass Museum members and VIPs during the opening event at Sugar on December 5th, 6pm - 9pm, where guests will also be treated to special performances by Yoli Mayor and DJ Jared Coetzee. The installation will be open to the public on December 4th, and throughout Art Basel & Miami Art Week during regular business hours at Sugar, from 4pm-close. This balloon will change the Brickell Skyline, serving as a beacon and thrusting D.A.M. & EAST, Miami into the international headlines as pioneer supporters of art in public spaces. 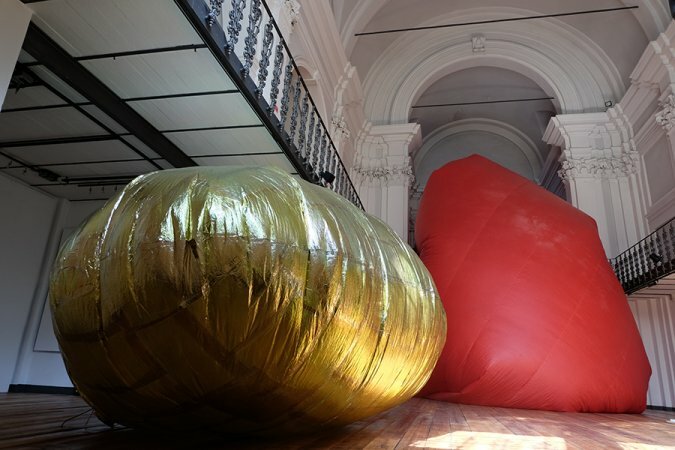 It has been five years since Italian Artist Stefano Ogliari Badessi impressed the world during the 56th Venice Biennial with Red Emotion, and a year since he made his American debut with another ephemeral site-specific installation, Inner Space, during Art Basel 2016. This year, Badessi is not only transforming Miami with a balloon installation atop the 40th floor of the iconic EAST, Miami, but also at the Scope Art Fair. The prestigious Scope Art Fair is located on 8th and Ocean Drive, Miami Beach, where 3,000 daily fair attendees will be able to interact with the installations. At night, viewers will see the illuminated installation brightening the Miami Beach landscape with his dream-like art. Limited editions of the sculptures will be available for purchase in the Directed Art Modern’s booth at Scope Art Fair. After each installation, Badessi deconstructs his balloon art and turns them into sculptures. For more information, please visit www.east-miami.com.